Fifth grade has gone into the wide, blue yonder. Kaci Heins, a fifth-grade teacher at the charter PEAK School, is taking advantage of a program that few other local teachers have. 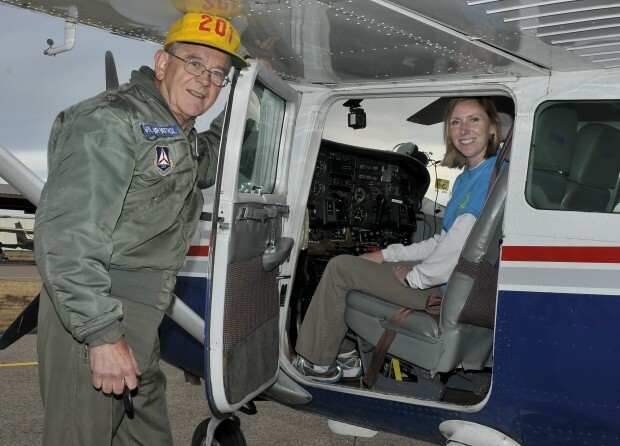 With the Civil Air Patrol's Aerospace Connections in Education program, Heins has gotten a treasure trove of curriculum, souvenirs and learning tools for her students, and a private flight over Flagstaff's impressive landscape. It's adventurous, and it's nearly free. Last weekend, Heins stepped up to a Cessna 206 with local CAP No. 201 squadron commander and Air Force veteran, Lt. Col. Charles 'Chuck' Bendixen. The two spent a good hour on the ground just going over the controls and instruments of the six-seat plane. Then it was time to take off. Bendixen pointed his craft east, and Heins was in awe. She saw her school, behind Salsa Brava in Sunnyside, and snapped photos of the roof. She saw Doney Park, the Schultz fire burn area, Grand Falls, the snow-speckled Peaks. As a geology buff -- Heins' father is a mining engineer, and her family has a rare hunk of calcite in the Smithsonian -- she gazed at the features that make Flagstaff a geology draw. She even steered the plane through a few turns. "It was so neat to see the volcanoes and the cinder cones and Sunset Crater," she said. The fresh scar of the Schultz fire was sad, but also intriguing to the one-time middle school science teacher. The famed Grand Falls near Leupp -- the ones with the rushing springtime flow of chocolate milk-like runoff -- also are fascinating from 10,000 feet above, where the viewer can see how the lava flow redirected the falls. "I was just blown away by that," Heins said. She said flying was on her "bucket list," and although the last five minutes were challenging with turbulence and getting stuffy under her coat, she proudly battled the urge to use the air sickness bag. None of her students came along, but Heins does all this for them. The CAP sent her a big box of schwag -- T-shirts, gliders and more -- and she's teaching her students the physics of flight to make the planes that look like specks floating through the sky less abstract. The program also lets her cover character education, physical outdoors activities and a look at careers in aerospace. Heins takes her science hands-on and knee-deep. She attended the Space Academy for Educators last summer and takes her students on field trips to Lowell Observatory, the U.S. Geological Survey, and the National Weather Service. This week, she had her class witness a weather balloon launch. "They aren't going to remember a test or a worksheet," she said. "It's going to be those experiences that they build on." Heins was surprised to find the Civil Air Patrol's program hasn't been tapped locally by other teachers in at least 10 years. But with some commitment and a $30 membership fee to the CAP -- the civilian auxiliary of the U.S. Air Force that often volunteers for aerial missions like search and rescues and educates the public and youth on aviation -- other teachers can participate, too. A submarine voyage might be next, if Heins can get on board with the Atmospheric Administration's teacher-at-sea program. 'I'm always ready for an adventure,' she said.